From 1st August 1972, Fahrzeugbau AG took over the rights from Marco Hausin & Co. Würenlos in order to launch full scale production of a trendy buggy vehicle. Right from the beginning, Mr. Guido Gaspar was in charge as company director. With a work force of 14 people, around 300 vehicles were assembled in 1973 in a new factory by Otelfingen. The body was made in polyester and outsourced from René Jäger in Berneck, a specialist in polyester fabrication. By September 1973, Mr. Caspar left the company being replaced by Mr. Peter Larice. The Swiss Buggy was sold as a complete assembled car and as a kit version. Only 15% were sold as a kit. The starting price for a complete assembled unit was at CHF 9.960, which was quite attractive. The success in sales required high quantities of refurbished and shortened VW Beetle chassis which was expensive and not readily available. Road handling issues needed to be solved too. Therefore, Mr. René P. Schmid, a major shareholder of Fahrzeugbau AG, was looking to replace the VW beetle platform with their own, improved chassis. This project, internally coded as P1, was commissioned at the end of October 1973 in order to be presented by March 1974 at the 44th Geneva Autosalon. Requests by the dealer network encouraged the company to focus on the emerging “leisure” car market and to expand the range with a more comfortable, closed-top body vehicle type and an all terrain 8 wheel AWD vehicle. Both made their debut as prototypes at Geneva Motor Show 1974. Although the company was a fast growing enterprise during 1973, this represented an enormous effort to get resources and the badly needed dealer’s attention! After the feedback from the Geneva Show, it was decided to prioritise the development of the closed-top body with the new P1 chassis, which went ahead into testing and approval phase. At that time, Volkswagenwerk AG was struggling financially. In early May 1974 they advised they could not continue to supply the air-cooled engine and gearbox. An alternative engine could not be found in the short term. The adaption of a water cooled motor would have been outside the budget. This seemed the end of the Swiss Buggy as well as the new closed-top body project. However, the management believed there was potential in the P1 chassis. Encouraged by the performance results, a decision was made to alter the design concept to a 2+1 seat sports vehicle utilizing a water cooled mid-engine. Fiat and Renault were contacted for support, but only Renault provided technical support and supplies. By the end of November 1974, a 2+1 rolling chassis prototype was completed as planned. The body was planned around a spacious passenger cell, featuring conventional aluminium doors, whereby other non supporting parts would be made in fibreglass. The building of the body could never materialise. Sales of the Swiss Buggy dropped sharply in the second half of 1974 due to the ongoing energy crisis. The economical environment forced the company to end all activities. During 1975 the company liquidated the remaining vehicle stock and by 1976, René P. Schmid converted the Fahrzeugbau AG in to Renesco Garagenbetriebe AG to prevent going into receivership. The VW platform: what went wrong? The unexpected sales boom from 1972 to 1973 created a major sourcing problem of using VW platforms. Volkswagenwerk AG (VW) refused to supply new platforms due to liability concerns. In a late attempt, Guido Caspar insisted VW make an exception, by arguing they should supply to the Karmann Karosseriewerke of Osnabruck. This was in vain, as VW promptly replied negatively with a short letter in August 1973, again via AMAG. In hindsight, management underestimated the consequences for the business by not deciding earlier to produce their own chassis. Why was it an issue? The Swiss road homologation – “Typenprüfung” demanded the use of the old version VW beetle platform, known as Type 1. The newer platforms from VW 1302 / 1303 were not permitted, leaving the company to source it from the used car market only. The refurbishing was quite costly and a time consuming operation. It had to be stripped down, sandblasted, the wheelbase shortened by 40cm and the “floor pan” eliminated. New steel L-beams were added to the laterals to provide more stiffness and to allow the fibreglass body to be bolted on. All critical safety parts had to be replaced by new ones, e.g. the steering unit, brakes, axle components, shock absorbers and the complete electrical installation. The road homologation restrictions and the complexity of the refurbishing task resulted in a long delivery time and cost, explaining also the reasons why only a small percentage of kits were sold. This handicap jeopardized the marketing and sales efforts of the company heavily. Guido Gaspar contacted Markus Hotz from HORAG, to conduct a study for a simple VW platform copy. That project was named “Studie 73-2”. Markus Hotz was a recognized racing car constructor and driver involved in the Formel Super V European Championship at that time. Somehow the project stuck and did not progress further. The unresolved chassis issue may have caused the early departure of Mr. Guido Gaspar as director of the company in early September 1973. The critical issue: roll-over safety With a 2m wheelbase and a ground clearance of 33cm the vehicle suffered from a high roll-centre causing handling problems with a quick load transfer when negotiating corners, even for expert drivers. Roger Gloor from the Automobile Revue wrote in his track test report: “…quite an adventure to keep the car on the road…” Even better evidence was described “After eight times rolling over in a road accident the body was ruined. The driver survived thanks to the rollover bar and safety belts”. René P. Schmid knew that by making a simple copy of the VW platform those issues were not sorted out. The call was made for a radical new chassis solution. The conflict wasbetween Guido Gaspar and René P. Schmid, and the company had to solve this. VW engine & gearbox: best choice, but no alternatives New gearboxes and engines were delivered via AMAG (VW importer) with full VW factory warranty of 12 months, although Fahrzeugbau AG limited it to 6 months or 10.000 Km. An exhaust system, develop and delivered by RESA AG, Hergiswil, had to be installed in order to meet regulations. The overall low cost and a contract supply agreement was the best option for the company. For Kit car builders, a swapping unit deal was available. Hard decision: producing a chassis The conflict situation within management about the platform issue was swiftly cleared after Guido Caspar left the company. René P. Schmid took the decision to produce their own chassis. The chassis had to be used for an up-graded version of the frugal Swiss Buggy as well as for a new closed-top 2+2 body, branded later as Fabino. VW 1300 or 1600cc air cooled engines and the 4 speed manual gearbox, contractually delivered via AMAG, were a must. The Kit car market was not being considered and therefore dropped. The briefing spec’s for the chassis addressed the safety, drivability, stiffness and comfort issues. What was required was a longer wheelbase of 2.30m, a lower, variable ground clearance of 1520cm and a slightly increased track. With these basic parameters the project was finally commissioned at the end of October 1973 under the internal code P1. The P1 chassis, designed with the Finite Element Method (very advanced at the time!) to meet torsional stiffness and particularly side crash impact, was made as a tubular space frame. The front suspension featured doubled triangular wishbones and at the rear, inclined semi-trailing arms were used. Gas filled shock absorbers from Bilstein allowed height adjustment. The steering unit with rack and pinion allowed a tight turning radius of 9m. French made Kleber tyres 195-HR70 were fitted to alloy wheels of 6,5-14”. Tank capacity of 40 litres was enough for the low fuel consuming VW engine. To keep the cost down and provide easy maintenance VW type3 parts e.g. brakes, wheel hubs and other components were used. The cost of the rolling chassis prototype including tooling was 9,220 CHF. The forecasted cost for a 100 units/year series were below 6,500 CHF. With further investment in tooling, an additional 15% cost reduction could be obtained. Just as the project started in October 1973 the OPEC countries of the Middle East announced their oil embargo. Known as the “70s Oil Crisis”, this led to a ban on Sunday driving and massive energy saving measures was suddenly introduced. Regardless of the economic environment all projects were pushed by management to meet the deadline for the Geneva Autosalon, March ‘74. Objective: the emerging leisure car market At the time, Fahrzeugbau AG was a "one product“ company and needed to expand into new niche markets. A 2+2 closed-top body and an all-terrain AWD vehicle seemed the way to go. Advertising literature prepared in three languages for the Geneva Show, demonstrated the expansion plans of the company. Even a new brand name FABO - derived from FahrzeugBau, Otelfingen- was created in order to get more international acceptance. The company earned particular acclaim for their achievements from the specialised press and visitors at the Geneva Show. Soon after, Peter Larice was busy organizing factory visits, club events, dealer days, etc. to maintain momentum. Good acceptance from dealers and customers raised high expectations for the new developments, while sales of the Swiss Buggy dropped. From alleluia to ashes -overnight! Volkswagenwerk AG announced a record operational loss of 800 Million German Marks in 1974. Nevertheless, 1974 was a critical year for another reason: it was the year that the Golf started production at the Wolfsburg plant. The beetle production was phased out. Consequently VW withdrew the supply deal for all air-cooled engines as from May ’74. All efforts and investment done in the new P1 chassis and Fabino body were blown away overnight. Together with the plummeting demand for Swiss Buggies concerns came up to stop the business. Such sobering new realities took their toll. René P. Schmid and Peter Larice abilities were in demand. An alternative air-cooled engine could not be found in the short term. The adaption of a water cooled engine to a buggy type vehicle would have been by far out of the budgeted limits. All scenarios were played. Evaluation-meetings were hot, hence the nickname EVA, later used. But if there was one thing to be learned in June 1974, at least in the auto business, it’s that making accurate forecasts in awful times was patently impossible. One conclusion was sure: The buggy boom was over. It was time for making bold predictions. In the short term, decisions were taken to wind down assembling operations. The workforce was reduced considerably and the factory area was split in half and put up for rent. The Fabo 748 was a long range programme, too far away to be ready for production and could not be considered to fill the business gap left. René Schmid’s idea was to sell licenses for the Fabo 748 production. However, the management soon detected the potential shown with the P1 chassis as an asset. Mr. J. Suss from Renault Division Moteurs, Vélizy, already involved with the FABO 748, was contacted for advice. He had vast expertise in the business and involved with DB, Alpine and Matra projects. The ex-René Bonnet's Renault-powered Matra car just switched to Simca/Chrysler engines. Matra launched the Bagheera in 1973, a mid-engined layout and three abreast seating concept. Its market success was notable and set a standard to follow. Encouraged by the P1 chassis performance, a decision was made to alter the P1 concept to a 2+1 seat sports vehicle utilizing a water cooled mid-engine. Total cost development and tooling were estimated at 313.000 CHF to build 3 units. Targeting the 30.000 CHF small sports car market, the plan was to assemble and sell one unit per week on the first year and double it the second year. That was a big step for the company competing for potential clients among established makes of that time such as Lotus Europa, Alpine 1600, Jensen Healey, Fiat X1/9. Mr. J. Suss committed to support the project by supplying engines from R17 TL, the 5 speed gearboxes from R16 and all other peripheral components at a reasonable package price of 3.050 CHF. The unit cost of the 2+1 car was estimated below 20.000 CHF including 120 man hours for final assembling. 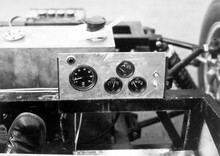 A running prototype had to be ready for early May of 1975. Although the necessary funding was not guaranteed, the project proposal looked acceptable. While the economical side was being sorted out with banks, René P. Schmid made an arbitrary decision early August ’74 to start building the rolling chassis. Consequently it was named P2 Renault-EVA. Three full time people were allocated to the project. René P. Schmid attempted to stem the looming crisis, but by end of November ’74, he had to stop all development activity and was forced to lay off all staff. Many lessons learned in a tough year. During 1975 the company liquidated the remaining vehicle stock with help of Peter Larice and in 1976, René P. Schmid converted it to Renesco Garagenbetriebe AG. It’s not clear what happen with the prototypes built. It seems that the prototypes remained in the factory till 1980. The last known was a sales ad placed in the AR for the P2 rolling chassis in March 1980, coinciding with the sale of Renesco company to Werner K. Rey. Fahrzeugbau AG - the structure and ownership Fahrzeugbau AG (Shareholder Company) was hold by Renesco Holding AG. Renesco Holding AG was owned by Mr René P. Schmid. It’s believed that the private bank Landau & Kimche, Zurich was his partner. Particularly Mr. Kimche Jr had been visiting the facilities in Otelfingen quite often. Renesco AG, was a fast growing and very profitable company of the group, specialising in waterproofing, grouting technology and building/structure preservation. Renesco AG also provided all administrative services centrally-even the phone desk- for the Fahrzeugbau AG company. René P. Schmid - The driving force behind the Fahrzeugbau AG was René P. Schmid, a gifted, swiss entrepreneur. He founded the Renesco AG in 1965 and sold the company in 1980 to Werner K. Rey, a capital venturist. The same year he founded RASCOR AG and raised it to an international corporation. Today he is a highly respected expert in the waterproofing sector. His pragmatic way, paired with a sound “what clients want” approach, made him quite convincing at all levels and made sure everybody worked in a single way. If the senior bank people had guaranteed the necessary funding for the P2 Renault project, the story of Fahrzeugbau AG would be written different as the car business soon started recovering at the end of 1975. But as a responsible manager he pulled the plug before creating damages. And for that he deserves all respect. Guido C. Gaspar - Guido Gaspar was the manager who transformed the Swiss Buggy operations to industrial manufacturing practices. All processes and modifications introduced in engineering, production or even sales areas were properly documented. He achieved the company’s homologation as car manufacturer by the authorities. His organizational capabilities, led to an unexpected, initial sales success. He also initiated the design of a more comfortable, closed-top body, later named Fabino. Disagreements how to tackle the chassis issue may have caused the reason for his early departure. Peter Larice - After Guido’s departure, Peter Larice took over the daily operations, focusing mainly in sales & distribution during a difficult period of the oil crisis. Peter and René formed a good management team. Although René Schmid demonstrated hands-on involvement in the development projects, Peter kept the staff motivation at a high level in tough times. Peter tested the P1 chassis most of the time, even on Saturdays. His knowledge and feedback reports to René were decisive. Peter Larice stayed linked with the motor industry, apparently he owns a large petrol station and a body repair shop in Zurich.
. Photos and detailed documentation kindly given by former employees. All statements reflect the author’s personal opinion and in no way represents official factory view. After 36 years all material, documents, pictures, drawings, etc are considered public and of non business interest.